I have two garments that display the logo for the National Football League Players Association. When I wear them out and about, I imagine that all who see me believe that I am an N.F.L. player, which, if you have been reading my recent blogs about the scouting combine, free agency, and not signing with the Jets, might think could be a possibility in the near future. I do have the size. However, I will admit in this public manner that I have not actually played in the NFL (yet). So how did I get the shirt and jacket? Read on. I was privileged to serve as co-counsel for an attorney who represents NFL players in workers’ compensation cases. Consequently, I got to attend a meeting for the NFLPA Workers’s Compensation Panel. At that meeting, they handed out some NFLPA gear, even to me, who is not in the NFLPA (yet), nor even a real member of the panel. Rather, I was a guest. I felt important. I still do. Since I already have the official NFLPA gear, my becoming a player would be more financially beneficial to the players’ union than getting as a new member any player who presently lacks an NFLPA shirt and jacket. I could agree to waive receiving further shirts and jackets, already being appropriately decked out. In these hard economic times, the union should support my efforts to get signed by the Broncos because of such savings in clothing costs for the union. 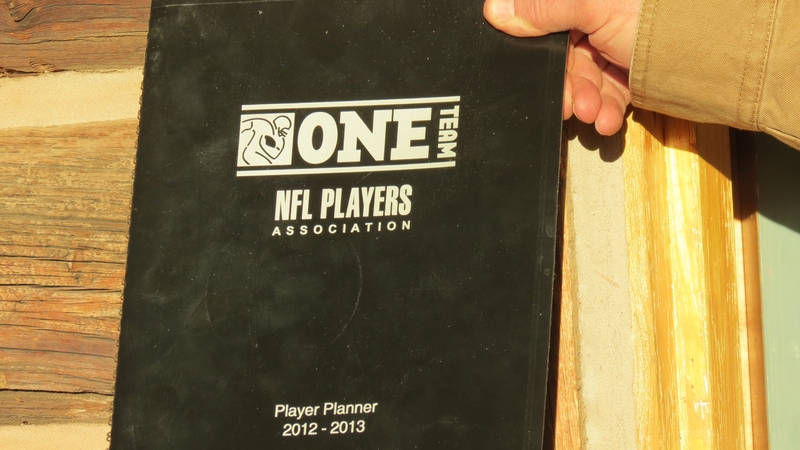 I also have an official NFL Players Association “Player Planner” calendar which gives dates such as when training camps open (July 15th). I like to carry my Player Planner with me to court scheduling conferences so I can check on my availability for hearings and trials. I find that I can read it better when I hold it up in a position that others in the room can read its cover as I slowly turn the pages of the calendar to see what is already on my schedule. I probably won’t have time to try cases after July 15th until the 2014 Super Bowl is over. The judges and opposing counsel should understand my priorities, and, as Bronco fans themselves, root for me throughout the season. In the far off future, when my career in the NFL is over, I am going to look into how I can get a shirt that says “NFL Alumni Association.” It will be a good conversation starter at the Senior Center. Like the “sit in” protesters of the ’60s, Beau emulates Gandhi by going limp when confronted by “the law.” Remember how the protesters would force the arresting officers to carry them to the paddy wagon? Well, Beau reacts in a very similar manner when told, as he was on this very day, to get out of the driver’s seat of my pickup and go to the back seat in the “supercab” compartment of the truck. Instead of obeying, Beau went limp, which would not be a problem if he was smaller. A toy poodle or even a jack russell terrier could be picked up and placed where I choose. An 85 lb. 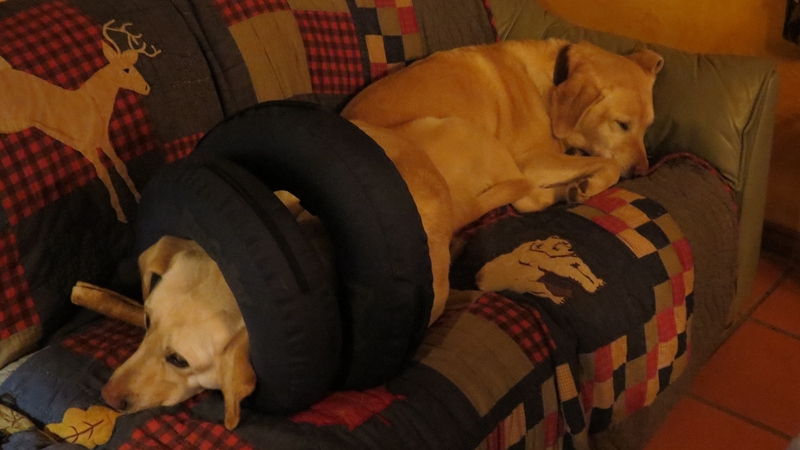 lab is a bigger problem, especially when he presses his slumped body against his chosen seat. So, I did what any other oppressor would do under such circumstances. I let him drive. Those of you who are professional football fans are already aware that the New York Jets are looking to trade Tim Tebow. I hear there are conversations among some of the teams while owners and general managers are hanging out at the National Football League Scouting Combine. As I have mentioned in a previous blog, I was not invited to attend the combine as a potential player. Well, I am not a team owner, scout, coach, general manager, or V.P. for Personnel either, so I stayed home. Now I am concerned that they are talking behind my back. No one has tweeted me about it, yet I have a funny feeling that I just might be the subject of some wheeling and dealing. As I wrote a couple days ago, I have been blessed with the perfect dimensions for an NFL linebacker — 6’2″, 247 lbs. What a specimen of manhood! I hope some team is not planning to draft me as a linebacker just to position themselves to trade me to the Jets for Tebow. Therefore, in fairness to all, I am taking this opportunity to declare one of the terms of my future contract. That is, I have geographical demands. Feel free to tell the world via your Twitter accounts. You may have the sports news scoop of the day. The following inside information is hereby being leaked to the sports media, then I will deny it. I might be limiting my draft value by saying this, but I will refuse to sign with the Jets. I don’t want to be coached by Rex Ryan, for one thing, but the real reason is that I have livestock to care for here in Colorado. I am willing to commute to Bronco headquarters at Dove Valley during the season. I understand that there will be occasional overnights for away games. I can make arrangements for those times. But I can’t go back and forth to New York every day. Realistically, the Denver Broncos are the only team I want to play for. Sure, there are teams located in many nice cities. I don’t want to offend anyone. I just am trying to be practical and realistic. I trust that this announcement will be appreciated as it is intended to save the other 31 teams from futile attempts to draft me or trade for me or sign me as a free agent. Then again, if they offer me a real good deal…. It might hurt me to have slightly tipped my hand. I want to be honest with the other owners. I will simply await getting that call from Mr. Bowlen, the owner of the Broncos. Don’t tell him I said so, but I would probably sign for the league minimum if he throws in a Ford F250 King Ranch diesel pickup. (I got that idea from Walt Garrison, who negotiated a horse trailer as part of his signing bonus.) See link below. In a previous post about the NFL Combine, I expressed my amazement about not being invited to the National Football League Scouting Combine. I also offered a possible explanation, which is that the scouts might have seen no need to know more about me than my dimensions since I am the perfect height and weight for an NFL linebacker. If that important information satisfies them, I need not worry about whether I will be drafted in the NFL draft in April. Silly as it seems for someone who is the perfect physical specimen to worry, in the event that I am not actually drafted due to some oversight by the 32 teams, it won’t hurt to have an alternative plan. Plan B is that I can be available as a free agent and signed after the draft. There is no shame in going that route. In fact, I have been an unsigned free agent for many years. This might be my lucky year when the Broncos in particular come to their senses. Peyton Manning was picked first in the first round after college. After being released by the Colts many years later, he was a free agent. As a free agent, he was invited to work out at the facilities of various interested teams. He also met with some team representatives who came to see him where he was working out. The teams wanted to check out his physical skills after having had neck surgery. He showed them that he could still throw the ball. When I was in college, before there was a combine, I had the experience of having scouts come to our campus to evaluate … someone who was not me, but who went on to be a Super Bowl quarterback (and retired awhile back). The scouts timed his release. They had him throw from a kneeling position to see how much was pure arm strength, I suppose. They timed him in the 40. He did okay. It was interesting to watch. Of course, as I stood there, the scouts missed out on the chance to put me through my paces. I have been waiting ever since, but this might be the year. Back then, I was not the perfect weight for an NFL linebacker, a goal that I achieved later. So now that I have the size they are looking for, I don’t mind letting them time me in the 40 or test my vertical leap, strength and quickness. My bum knee slows me down a little, but with the professional trainers and team physicians and strength coaches each NFL team offers, they could fix me up. So, I am taking this opportunity to announce my availability as a free agent. Team owners, scouts and coaches may reach me through posting a comment on this blog and I will then provide my secret contact information, which will allow us to select a meeting place. I look forward to hearing from you NFL folks when you get back from the combine. Who do you think fits that description? That’s correct. It is I. No brag, just fact. My physician suggested at my annual physical that I lose some weight. Is he kidding? Is he trying to sabotage my NFL career? Is he doing it out of jealousy? What does he think I am, a kicker? After my careful research, it is obvious that my natural position is linebacker, so I am going to stick with God’s design for me. Now all I have to do is await that call during the NFL draft. The scouts probably did not want me to come to the combine because I am so special, so rarely perfect, that it would be a waste of everyone’s time for me to go through meaningless drills with the poor players who are less than perfect. I see what is going on and I smile to myself. When my wife foolishly cuts back on my portions, I have to remind her of the importance of keeping my weight up. Many devout Christians give something up during Lent. Often it is something they enjoy, such as giving up chocolate. Some people use this period of time sort of like another chance for a New Year’s resolution. I have a friend who is trying to refrain from using profanity. There was a documentary titled “Catfish” which is about internet relationships. Now there is a television show on MTV that follows up on the theme. According to the episode that I saw, some people create false profiles on social media sites. It is a shame that no one told Manti Te’o, the Notre Dame football player who was the victim of a hoax, to beware of such dangers of social media. As it turned out, Manti’s attractive girlfriend did not exist. She was made up by a male pretending to be a young woman. How disappointing for Manti to mourn the death of a girlfriend who never died because she never lived, except in the imagination of the hoaxster, and, consequently, in the imagination of Manti. Well, if Manti will watch the TV show Catfish, he can be comforted by knowing he is not the only naive person to be fooled into falling for a person who is not real. Misery loves company, they say, and there is reported to be lots of misery caused by tricksters on the internet. You should probably be suspicious if you see on the internet photos of a beautiful woman or handsome man, correspond with such person, but find the object of your affection is unavailable by phone and avoids meeting you in person. Actually, Manti did talk on the phone with his fake girlfriend, but never actually met her. One way the guys on Catfish uncover frauds is to use a tool called Google Image Search, which has produced unhappy results when the beautiful image is another person rather than the name using the image. For example, a homely man could steal Brad Pitt’s image from any of a number of them that appear on the internet and post it on his Facebook as his own. Women who think the Facebook guy looks like that might contact that homely man, whose picture they are not seeing, and want to chat on Facebook with a person who looks like Brad Pitt. Of course, Brad is well known so that would probably not work. What happens is that the fakers find some attractive person, male or female, who is not well known and use that image as their own, expecting no one to recognize the person in the photo who the faker desires to look like. Understanding the process caused me to fear for the misuse of my own image. So I “googled” my own image to see if anyone was using it to attract women. I was pretty upset to learn that George Clooney is posting my photo on his profile. 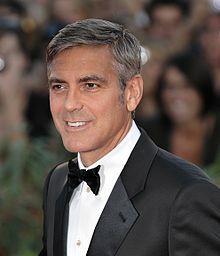 The movie star that you probably think is soooo handsome is not George Clooney at all. It is me! Well, it is kinda flattering. I ain’t gonna say nothing. Let him enjoy the adoration that is actually the result of substituting my good looks for whatever he really looks like. The photo below is of me, not George Clooney. He wants people to think he looks like this. It does make me wonder what George Clooney really looks like. If this is not me, how do you think I got Miss Sugar, a hot model/Miss Texas, to marry me? Back in the day, she had to meet me in person. I could not fool her with a fake photo so it is a good thing I am this good-looking in person. I took her breath away. I’m used to it though. Not every woman I pass on the street tells me that in so many words, but I can see it in their eyes. I can hear the longing gasps. Welcome to my world. Isn’t Miss Sugar cute! She takes my breath away! I am thinking about asking her to be my Facebook friend as soon as I get a Facebook account. Of course, if it turns out that this photo is not of her, I’m going to have to unfriend her. (Manti Te’o taught me the importance of having a real girlfriend.) Miss Sugar seems like a fantasy, but in addition to contacting her by email, I have actually talked to her on the phone, not to mention going on a number of dates with her and actually getting married with her. So far, she has checked out as being real. I’m not so sure about George Clooney. 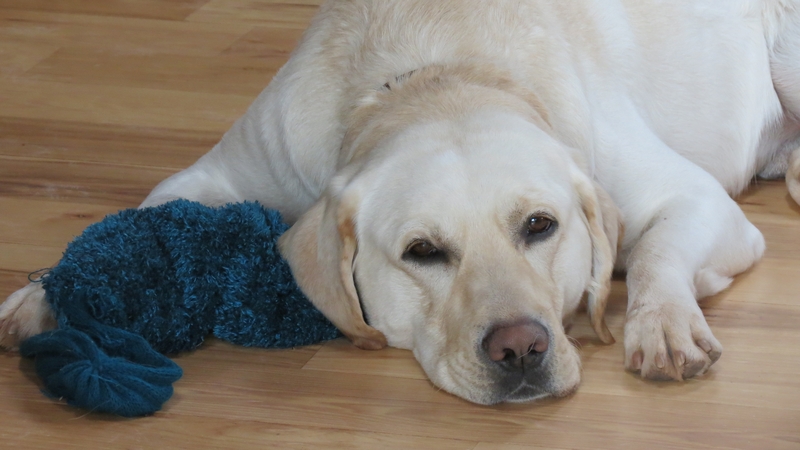 we adopted another yellow dog from the Cheyenne Animal Shelter for lonely Sadie to have company. His name is Beau. 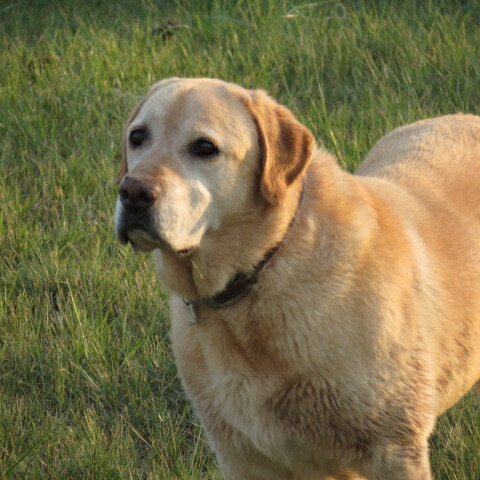 Unlike Old Yeller and Max, Beau is not yet worthy of the esteemed title of Best Doggone Dog in the West. He is not even the best doggone dog living at our house. 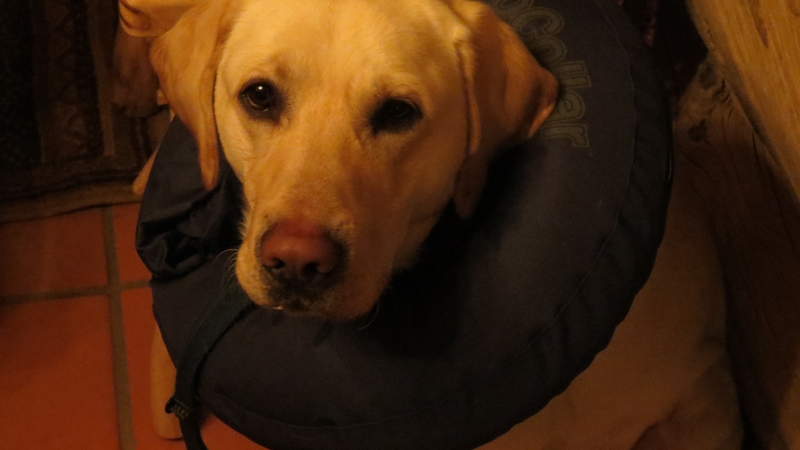 When he is in a room alone, it is doubtful that he would be called the best doggone dog. There might be good reasons that he was available for adoption. I doubt that his prior owners were simply tired of winning trophies at obedience trials. I doubt that obedience was in the vocabulary of them or him. Miss Sugar, soft-hearted animal lover, is, nevertheless, not permissive when it comes to peeing in the house, stealing her breakfast off the counter, or chewing boots and slippers. She won’t let me get away with such behavior and neither will she tolerate such behavior from Beau. I keep telling her that Beau will come in handy when we go hunting wild pigs. He has had his rabies shot, so it should turn out okay. Sugar will also be glad to have him if she ever falls into an abandoned well. Oh, that was Lassie. Nevermind. I will have to just stick with the pig argument about what New Yeller might be good for. That and keeping Sadie company. She is no longer depressed. She does not have time. She has to babysit every minute, night and day. Only celebrities, some of whom I have heard of, are allowed to compete on Dances with the Stars. However, be not dismayed, the general public may audition for America’s Got Talent. Certainly not all contestants are dancers, but dancers are allowed to audition. I wondered, as I watched, if the poor kid has a father. Did his father ask him if he wanted to try out for Little League Baseball or take ballet? So, I have lived by those words of my father. And that is why you won’t see me dancing on television, with or without the stars. Is there an age limit on American Idol? I need to know before I spend too much time rehearsing for my audition. Some, when given the big chance, do not sound born to sing. They sound tone deaf. Now that is something about which I can relate. I was born to listen to music rather than perform it. When I was in high school, I signed up for Senior Choir. It was a large group of probably 100 students in a large high school of 2,000 plus. For the school talent show, the choir performed scenes from the musical Kismet. We wore costumes for the production. We had a choreographer. I was picked to be the king, around whom dancing girls danced. That was pretty cool except one of them was my cousin. I was the center of attention. What an honor! I’d like to think I was picked for being so kingly in my appearance. Noble. Regal. However, there might have been another reason. As king, I was instructed to — not sing. I was the only one in the choir not singing. I also was not dancing. I stood with my arms crossed, looking royally handsome (thanks to make-up, turban and fake beard). The second example is my recent duet in church. What led up to that? Well, I married a singer. Miss Sugar was a vocal performance major in college before switching to get her degree in education. Nevertheless, she has performed as a soloist in church countless times over the years. She sings professionally, getting paid for singing at weddings and funerals. She sang background on a recording for a rock album back in the day. She has had roles in community theater and dinner theater musicals. I have not competed with her in these endeavors. I have been a good listener. Miss Sugar, having heard the beauty of my voice in the shower and in the car, invited me to sing the Alleluia refrain with her during one of her solos at church. We practiced in the car. We sounded wonderful. We sounded wonderful until the time in the service arrived for us to sing. We had microphones so the congregants in the far reaches of the sanctuary could hear clearly. They did hear clearly. They could hear me better than they could hear Miss Sugar because her microphone cut out. You shoulda been there. It was somethin’. So now I’m thinking of America’s Got Talent as a better contest for me because it is not just for singers. Wait until you see me dance!